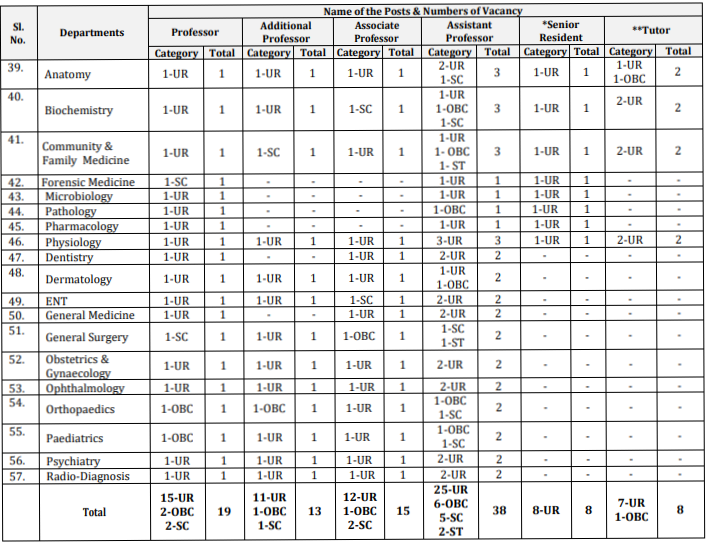 All India Institute of Medical Sciences Bhubaneswar (AIIMS Bhubaneswar) has released Notification for the posts of Faculty, SR, Tutor having 101 vacancies on its official websiteaiimsbhubaneswar.edu.in. Interested and eligible candidates can Apply Online before the Last Date i.e., 11/03/2019. Required details like educational qualification, age limit, Selection process of AIIMS Bhubaneswar Notification 2019 are given below. AIIMS Bhubaneswar Recruitment 2019 – Apply through Online for 101 vacancies of Faculty, SR, Tutor posts: All India Institute of Medical Sciences Bhubaneswar recently released a job notification on its official website aiimsbhubaneswar.edu.in for Faculty, SR, Tutor posts. Candidates are allowed to apply for AIIMS Bhubaneswar Recruitment 2019 from 22-01-2019 to 11/03/2019. Candidate can find the further details like Eligibility Criteria, Age limit, the Selection process of AIIMS Bhubaneswar Recruitment 2019 on the below page. Job Seekers can apply for the post through the Official page aiimsbhubaneswar.edu.in and careers99.com. Interested Job Aspirants who are ready to apply for All India Institute of Medical Sciences Bhubaneswar 2019 Notification must possess the below-given Eligibility Details. Selected candidates will get Rs.15,600-39,100+AGP Rs.8,000 (6th CPC) / Rs.37,400-67,000+AGP Rs.9,000 (6th CPC) by the Recruiting Organization. First of all, Open Official Website i.e., aiimsbhubaneswar.edu.in or Below Mentioned link from careers99.com Website.